People are drinking the Twitter Kool-Aid like it’s the last day before Prohibition. It’s fantastic that so many are finding value in something so simple that can be so powerful. But many in the latest wave (more like a tsunami) of Twitterers seem to be overlooking a fundamental premise of the Twitter follower/following paradigm, which is that people only know as much about you as you tell them. Having a succinct, compelling profile is more critical on Twitter than anywhere else. Just as the landing page is the most important component of a PPC, email, or banner ad campaign, your Twitter profile is the most important landing page for your personal brand. Every time you follow someone, they will be asked to make a decision on whether to follow you back. At scale, these decisions are made in increasingly large batches, and are made quickly. I’m not Twitter royalty, but routinely get 50+ follow emails per day. For each of these, I visit the person’s profile page and decide whether to follow back. And just like on a landing page, I scan and make this follow/no follow decision in about 8 seconds or fewer. I realize your real name may not be available, but try to get as close as possible. This isn’t an AOL chat room circa 1997, this is business (at least partially). Using made up names makes it very difficult to tie your Twitter profile to your Facebook, LinkedIn, blog comment and other profiles (unless Twitter adopts Facebook Connect). Further, five weeks from now when I see “@batgirl63” in the tweet stream, it’s difficult to remember who you are. Ideally, use the same photo on Twitter, Facebook, LinkedIn et al. Easier to remember that way. And I don’t encourage frequent changing of your photo, as many Twitterers have commented that they look at and remember profile photos more than usernames. Each Twitterer has multiple spheres in which they operate, sometimes intersecting and overlapping. You want to belong to as many spheres as are practical and relevant to your interests and expertise. It’s helpful if you define your spheres before jumping in, as it will make your following decisions and bio creation much easier. I’ve defined my spheres as: Geographic (Flagstaff, AZ & Phoenix, AZ), Professional (Social Media, Email, Public Relations, Ad Agencies, Digital Marketing), and Recreational/Peripheral (Wine, Food, Sports, Restaurants, Kindle, iPhone, Mac). I have followers in each of these spheres, and I want to follow others that have interest/experience in one or more of these areas. Just as you would when optimizing a Web page for search engines, when you write your Twitter bio think about your desired spheres and include words and phrases about them. A touch of personality is helpful, too. 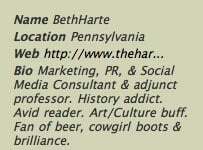 Here’s a good example, from @bethharte You get a taste of her multiple spheres. Here’s a bad example. I literally have no idea what this means and cannot make a logical following decision, so I’m not following. Even if you don’t have a blog or a Web site, link to a more complete bio and profile of yourself on LinkedIn or elsewhere. @briansolis links to his Wikipedia page, which is useful. Seriously, what’s the point of being on Twitter if people have to jump through hoops to follow you? It completely runs counter to the spirit of community. If you don’t want people to see your tweets, maybe you should stick to LinkedIn and Facebook where your connections are typically your friends/associates in the real world. Certain Twitterers’ following/followers ratio makes it seem like they are using Twitter inappropriately. When you are following 1,997 people, and have 57 following you back, it looks like you are randomly following as many as you can, hoping for follow backs. That’s essentially “follower spam” and it calls your motives into question. You’ll get fewer followers, not more, with that approach. Any ingredients I missed? 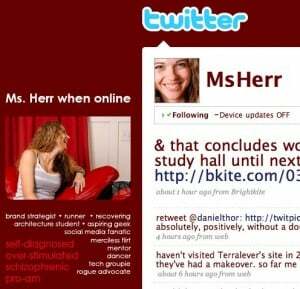 What are your experiences with your Twitter profile?